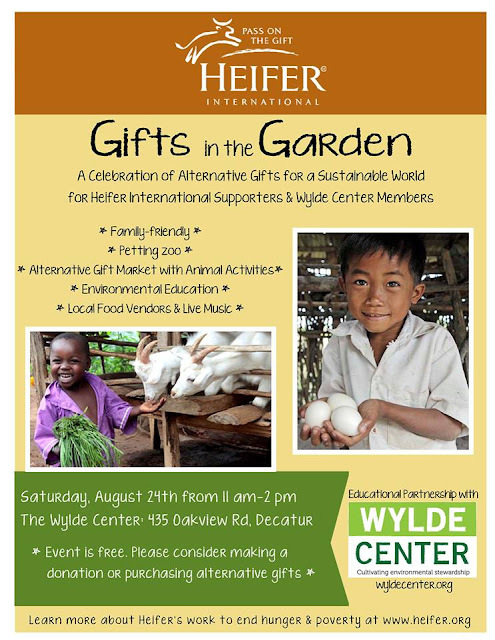 Heifer International and the Wylde Center have teamed up to bring you Gifts in the Garden! Heifer International supporters, Wylde Center members and their friends and family are inviting the general public to join them for a Free Family Event celebrating Alternative Gifts. Alternative Gift Market with booths and games for all of the animals Heifer International provides to families in need around the world. See, touch and say hello to barnyard animals with Cricket’s Mobile Petting Zoo. Food vendors, including King of Pops! LIVE MUSIC by MoRhythm and local kids band Route 41! 12-1pm - Route 41 is made up of Jordan (12), Ethan (12), Gavin (12) and Evan (10) who have been playing together for the past 3 years. They will entertain you with songs from the past and current covers too. Come out and enjoy this band with rock and soul! 1-2pm - MoRhythm enjoy performing and that joy is palpable. “Music is our passion and we love bringing it to all who will listen!” Not your typical three piece, the band consists of Matt Donald on guitar, bass and vocals, Melissa Gouinlock on percussion, guitar and vocals, and Brian Walkabout on harmonica, percussion and vocals. They bring an eclectic mix of genres and styles of original pieces along with carefully chosen cover songs. Heifer International’s mission is to work with communities to end hunger and poverty and care for the Earth. Our animals don’t just provide project partners with a reliable source of food, but also a reliable source of income. Learn more at www.heifer.org. The Wylde Center’s mission is to cultivate vibrant greenspace and inspire a community of environmental stewards. The Wylde Center actively engages youth, families, and individuals in their environment, health, and community through organized programs, classes, and events that develop creative skills in sustainable urban living, organic gardening, health and nutrition. Join as a member today.